In Cathedrals of Science, Patrick Coffey describes how chemistry got its modern footing-how thirteen brilliant men and one woman struggled with the laws of the universe and with each other. They wanted to discover how the world worked, but they also wanted credit for making those discoveries, and their personalities often affected how that credit was assigned. Gilbert Lewis, for example, could be reclusive and resentful, and his enmity with Walther Nernstmay have cost him the Nobel Prize; Irving Langmuir, gregarious and charming, "rediscovered" Lewis's theory of the chemical bond and received much of the credit for it. Langmuir's personality smoothed his path to the Nobel Prize over Lewis. Coffey deals with moral and societal issues as well. These same scientists were the first to be seen by their countries as military assets. Fritz Haber, dubbed the "father of chemical warfare," pioneered the use of poison gas in World War I-vividly described-and Glenn Seaborg and Harold Urey were leaders in World War II's Manhattan Project; Urey and Linus Pauling worked for nuclear disarmament after the war. Science was not always fair, and many were excluded. The Nazis pushed Jewishscientists like Haber from their posts in the 1930s. Anti-Semitism was also a force in American chemistry, and few women were allowed in; Pauling, for example, used his influence to cut off the funding and block the publications of his rival, Dorothy Wrinch. 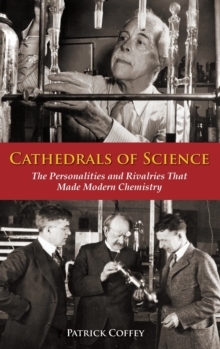 Cathedrals of Science paints a colorful portrait of the building of modern chemistry from the late 19th to the mid-20th century.